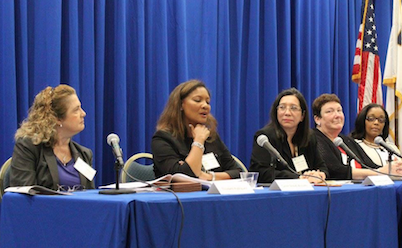 The Florida Diversity Council hosted its 2016 South Florida Women in Leadership Symposium at Florida International University’s Wolfe University Center on March 11th. This annual event attracted approximately 120 attendees who gathered to hear from local executives about their insights regarding the event theme of Securing Your Place at the Table. The half-day event featured multiple business leaders from various organizations discussing topics such as “Developing Political Savvy,” “Positioning Yourself for the Next Big Opportunity,” and “Finding and Owning Your Voice.” The symposiums began with a welcome and formal introduction of the participating panelists. Each panelist was able to address a specific topic of discussion in addition to engaging with the other panelists regarding the panel topics. Question and answer sessions were also held during the event, promoting participation amongst attendees. The Florida Diversity Council would like to thank the event sponsors for their support of the Women in Leadership Symposium: Wyndham Vacation Ownership, Walmart, Florida International University, Ocean Bank, and Right Management. Special thanks to all the volunteers, speakers and attendees for helping to make this event a success. Symposium photos and program booklet can be found here.